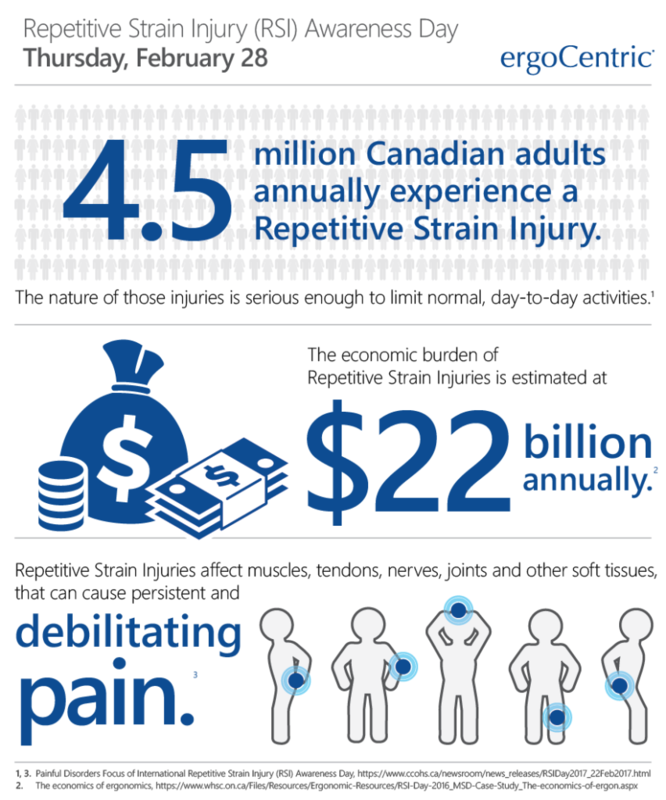 Mississauga, Ontario―February 14, 2019―Ahead of Repetitive Strain Injury (RSI) Awareness Day, ergoCentric Seating Systems is aiming to raise awareness in support of the upcoming international day, which is set for Thursday, February 28th. According to the Canadian Centre for Occupational Health and Safety, 4.5 million Canadian adults annually experience a Repetitive Strain Injury that is serious enough to limit normal, day-to-day activities, and comes with an economic burden estimated at $22 billion annually. The majority of these injuries are caused by work- related activities. While ordinary movements performed in the workplace – such as clicking, lifting, twisting, and reaching – should not cause discomfort, it’s been established that these tasks, when repeated, can lead to constant and sometimes irreversible pain. RSIs, also known as work-related musculoskeletal disorders (WMSDs) affect muscles, tendons, nerves, joints, and other soft tissues, and can cause persistent and debilitating pain. These injuries – which typically impact the back, neck, shoulders, forearms, hands, wrists, elbows, and lower limbs – can lead to pain, tingling, discomfort, numbness, weakness, and restricted movement. The good news is Repetitive Strain Injuries are preventable. By using ergoCentric task chairs, height adjustable tables, and making regular adjustments, office-based employees can ensure their body receives the proper support and movement needed to comfortably perform tasks, optimize health, and increase overall productivity. Moreover, providing office workers with a fully ergonomic seating solution and the necessary training to go with it can prevent RSIs, thus having a positive overall impact on workplace productivity. Due to an everchanging workforce made up of an aging population, immigration, and the need to accommodate individuals with disabilities, it can be difficult for one chair to fit every worker. In taking a modular approach to manufacturing, however, ergoCentric’s office chairs can be customized to accommodate a variety of bodies, tasks, and environments, ensuring a perfect fit for virtually every employee. For more information, please contact Sarah Miller at 647-335-4000 or via email at [email protected]. To download this press release in PDF format, click here.